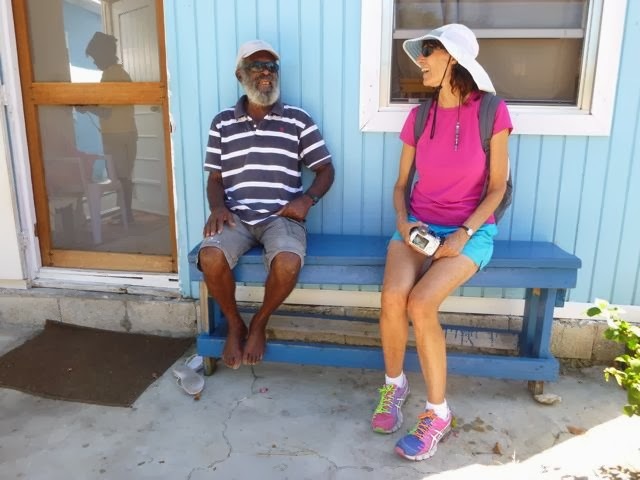 Willy chats with Ruth; his wife Betty's inside, initially. "Garden of Eden -- a must-see for cruisers" signs scattered throughout Black Point proclaim. Ditto the guidebooks. "The clouds. I was inspired by the clouds," Willy muses, whimsically, about his work. The Garden of Eden is a sweet spot, with informal winding paths across porous limestone dotted with with driftwood sculptures. Most likely, Willy will wander up to you with a smile, warmly welcome you to his home and garden, and offer you something from one of his fruit trees. He'll happily tell you what he saw in each, though he'd rather you search for your own meanings from his images. Will spent 30 years building his garden. Now, at 74 years young, he and his lovely wife Betty spend their time enjoying the fruits of his labors. Local source for definitely free range eggs! "They called me a fool," Willy confides. "They said no one could get anything to grow here. But look! Now they ask me how I did it, and I tell them, 'How can a fool tell them?'" He treated fellow cruiser Ruth of Wabi Sabi and me to a bit of sticky sapodilla from his rocky garden. 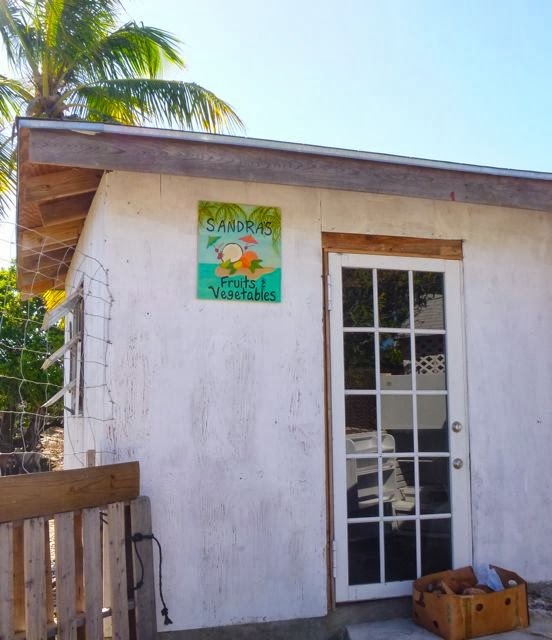 The garden's also full of thriving coconuts, papayas, soursops, nonos ("Stinky, but good for the health," Willy says), bananas and who knows what all else. fresh, local eggs from Sandra, Black Point. Go to Garden of Eden not because of the sculpture, or even the possibility of a bit or locally grown fruit, but for the delight in getting to know Willy and perhaps even Betty. On the way back, stop at Sandra's Produce; you might have to look around back to let Sandra know you're there. 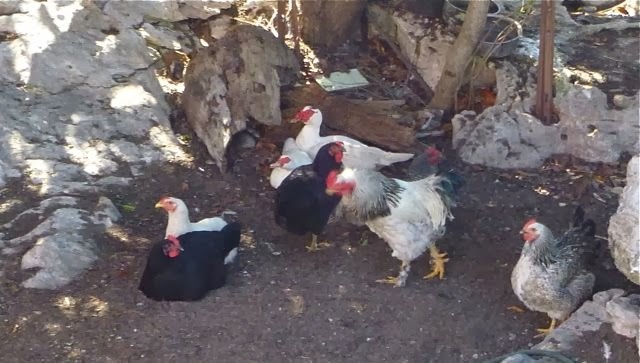 If your timing's right, you might even pick up some eggs, laid from the hens wandering free in her back yard. 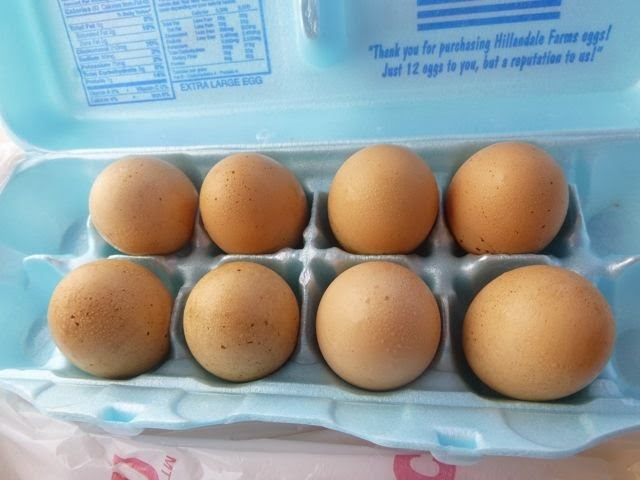 It's the first time we found farm fresh eggs since we started cruising, other than the hideously expensive ones in St. Thomas last year we opted not to buy. Willy's certainly not the only local more than happy to chat. Among the others? the street from Willy's Garden of Eden. 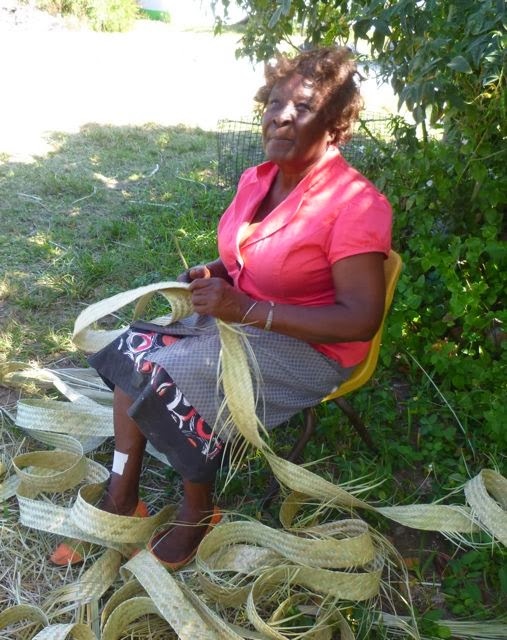 Earlier, we chatted with Frances, one of many Black Point residents busy plaiting palmetto fronds for sale in Nassau for straw work creations, typically baskets. Ruth and Pierce had befriended Frances earlier in their wanderings. "That bean dip was good!" said Ida of Black Point laundry / store / salon / cottage rentals. She'd asked for the recipe when I told her I was making it. Her store sells a pretty delish slide of carrot cake for a mere $1; lunch for me, two days in a row while I wandered the island. She gave me a great and much-needed haircut, too. Perhaps the busiest businesswoman on the island, she confides, "I work hard from December to May." Why does our otherwise reliable Lonely Planet The Bahamas guide book claim "Black Point has the reputation for not being the friendliest place (it's generally not used to receiving visitors)"? That is a mystery! There's few places I've been that are friendlier; that was true this year, and last. February 23, 2014 BAHAMAS. 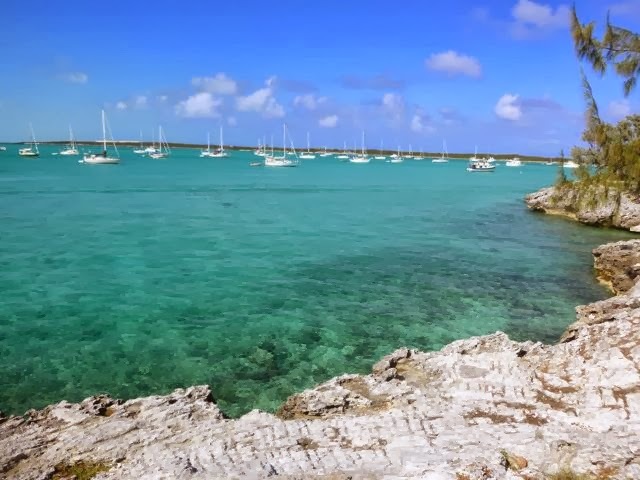 Prescheduled from Black Point, Great Guana Cay, Exumas (N24.10.937 W.76.24.291). By the time you read this, we'll be anchored at a TBD isolated harbor further South on Great Guana Cay (no internet). 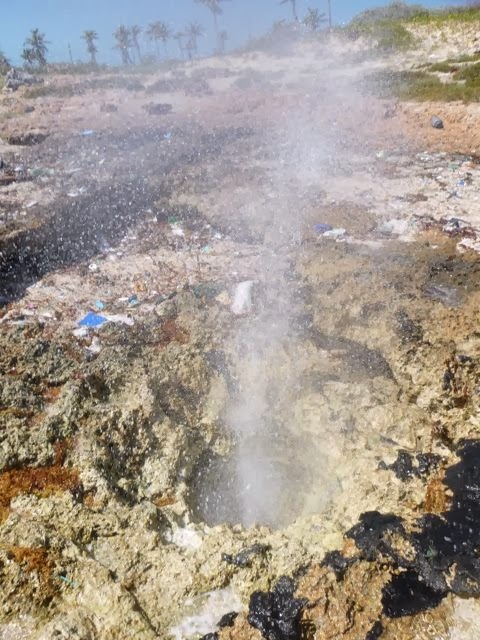 Blow hole at Black Point. Got too close to blowhole! Wet legs.